Peacocks have been considered for thousands of years, as the world’s most beautiful of all birds. Both sexes including the “peahen” female, and the “peacock” male, are correctly known as “peafowl”, although both genders are commonly known as the Peacock variety of bird. The male Peacock, in full plumage, is a spectacular sight. The blue-green, iridescent feathers have been prized and valued for thousands of years, as they still are today. Peafowl originated in Southern Asia and Malaysia, and have been revered in their native countries as long as history has recorded their existence. Peafowl were kept as exotic pets in China and later Europe by royalty and the aristocracy. There are two breed types within the species that are classed according to their plumage differences. The first and more common variety is the “Indian Peacock” (Pavo-Cristatus), often called the Blue Peafowl. 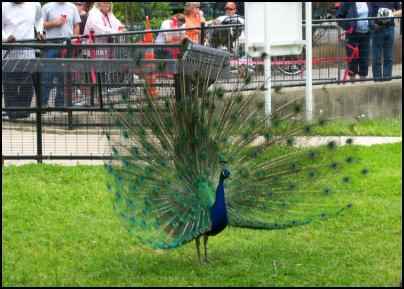 This variety is today the common breed of Peafowl found in North America, and hails from India. This breed is hardier than its counterpart, and less expensive, as well as more readily available to purchase from breeders. The second, less commonly seen variety is the “Green Peafowl” (Pavo-Muticus), which is native to the Far-East of Burma, Thailand, and Indo-China. This variety by a lesser availability is more expensive, more rare, more susceptible to cold and generally not as hardy. The plumage on these two varieties differ in color, but body weight and size are comparable. The Peacock has been present throughout history, as a decorative “exotic” pet as well as a meat bird. The Phoenicians brought Peacocks to Egypt more than 3,000 years ago to decorate the temples, where they were considered good luck. In dream symbology, for thousands of years, the Peacock has symbolized pride and the presence of ego, and this was reflected in the motivation for ancient people’s reverence of this beautiful and almost mystical bird. The phrase “Proud as a Peacock” is reflective of this anciently held belief. 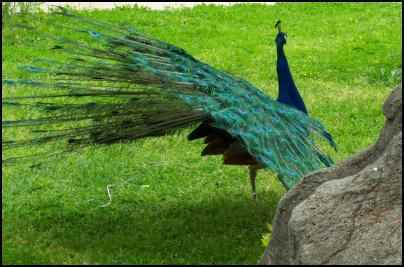 Peafowl were kept in biblical times, and Medieval Europe, for the dual purposes of meat and beauty. Fortunately for the Peacock, after the 16th century when domestic meat birds, such as turkeys, were imported from Mexico, the peacock was no longer used as a meat bird, in deference to the fleshier and heavier turkey. Thus, the Peacock truly became exclusively an exotic pet in most parts of the world, allowed to simply be beautiful and die of old age. The male Peacock exhibits a unique call during breeding, normally in the spring, and at other times in the presence of females, which sounds like the word “HELP”. Many a person has been known to come running to that sound, finding only a proud peacock on the other end! Males will normally only display their large and magnificent plumage in the presence of a peahen, and it is advisable to keep one of each if an owner ever wants to see this colorful display. Peafowl are extremely easy to keep, and are considered one of the easiest of all domestic birds to raise and care for. They can be fed game-bird or pheasant mixed grain, game bird crumbles—both available through feed suppliers—and a regular offering of a variety of greens. These birds are naturally disease resistant, having not been over-bred or inbred as so many other domestically raised commercial poultry has been. It is almost unheard of for Peafowl to become ill, and in healthy conditions with an appropriate diet, they can, and do, literally live for decades. Many Peacocks are kept “wild” in parks for the enjoyment of visitors, with freedom of their own movement at will, and can breed successfully without any interference from their human caretakers. But they can also be successfully raised on a farm setting, and can be allowed to run free or kept in either open or closed-topped pens for protection from predators if that is an issue. If kept in an enclosure, Peafowl should be given adequate room to move about, exercise, and maintain a healthy range of motion within that enclosure. Because peafowl will rarely stray from their home territory, as long as predation is not an issue, they can be given the freedom to just hang-out on the farm and enjoy the freedom of going where they like. They will almost never attack other poultry kept on the farm nor will they attack humans or other animals. They have a docile personality, and are normally inquisitive and interested the goings-on around them. Peahens are considered excellent and instinctively driven mothers. Peachicks can also be raised just effectively in an electric brooder as with other poultry peeps. They are considered among the easiest of all birds to raise because of their superior intelligence compared to other poultry, and because of their inborn hardiness. Peafowl need shelter from the cold and wind, and where snow coverage or sub-zero temperatures are a factor, a coop or hutch that is insulated, enclosed and warm, as for laying hens, is adequate. In more temperate climates, peafowl will roost on low branches of shrubbery, or find other accommodation quite easily. As with all domestically kept animals, shelter should be offered and available at all months of the year, including the hot months of July and August to prevent heat exhaustion. The peacock is a unique exotic, and raising these birds for the simple joy of their beauty is truly one of the pleasures of animal husbandry. There is a good market for these birds, as a thing of beauty and joy to their owners, and rearing and caring for them is a relative breeze compared to other types of poultry. They will bring a good price at exotic auctions and on the private sales market. Peafowl have the distinction of joining the ranks of those exotic livestock breeds that are allowing for the much-needed diversification in the livestock industry.